Acute severe ulcerative colitis is a life-threatening medical emergency, which can be associated with significant morbidity and is preventable through prompt and effective management. Corticosteroids remain the cornerstone of initial therapy, although a third of patients will not respond. Further management hinges on timely decisions with use of rescue therapy with ciclosporin or infliximab, without compromising the health or safety of the patient, or timely surgery. Although such patients need specialist care, it is imperative that emergency care physicians are aware of the important principles of management of this condition to achieve successful outcomes. Risk stratification and the use of predictive models using clinical parameters have reduced the morbidity associated with this condition.We discuss current evidence and present a clinical approach to clinicians involved in the emergency care of patients with acute severe ulcerative colitis in this review. The majority of patients tend to have a mild-moderate disease course, but 20%–25% of patients may experience a severe exacerbation (flare) requiring hospitalisation4 for prompt medical treatment and due consideration for colectomy if medical therapy fails. The morbidity associated with acute severe UC (ASUC) is considerable with a 30%–40% risk of colectomy after one or more severe exacerbations and 10%–20% likely to need colectomy in their first admission.4–7 The UK National IBD audit reported that despite improvements in quality standards, and improving outcomes for patients with ASUC, there remains considerable morbidity and 1% mortality associated with it.6 Although it is imperative that a gastroenterologist with expertise in inflammatory bowel disease (IBD) manages these patients, clinicians involved in emergency care should also be aware of the important principles and considerations in the management of these patients to achieve successful outcomes. This review discusses the diagnosis and management of ASUC, current and evolving evidence with the use of medical salvage therapies and presents a practical approach for management to clinicians. ASUC typically presents as an acute on chronic disease and also in a relapsing–remitting pattern but may be the presenting feature of new onset UC in approximately a third of patients.4 ASUC is defined by the Truelove and Witts criteria8 (table 1) and European Crohn’s and Colitis Organisation criteria, which includes C reactive protein (CRP) >30 mg/L.2 Patients with ASUC require immediate hospitalisation for intensive management in a specialist gastroenterology facility for joint medical, surgical and nursing care. Criteria for admission are defined in table 1. On admission, a full blood count, urea, electrolytes (including serum magnesium), creatinine, CRP, erythrocyte sedimentation rate, liver chemistry, a lipid profile, abdominal radiograph and stool tests for culture, microscopy and sensitivity along with Clostridium difficile testing should be arranged (figure 1). The differential diagnosis of diarrhoea with bleeding should be considered and is listed in table 2. Algorithm for management of acute severe ulcerative colitis. CMV; cytomegalovirus, ESR; erythrocyte sedimentation rate, 5ASA; 5-aminosalicylic acid, TPMT; thiopurine methyl transferase. Most patients will need intravenous fluids with correction of electrolyte imbalance; in particular, serum potassium as hypokalaemia can predispose to colonic dilatation. Nutritional assessment and optimisation of nutritional status under the supervision of an expert dietician is important for successful outcomes. There is no proven advantage to the routine use of bowel rest or parenteral nutrition and enteral nutrition is associated with lower complications as compared with parenteral nutrition.11 12 Nutritional deficiencies should be corrected. Oral iron therapy is probably best avoided, with anecdotal reports suggesting that it can aggravate mucosal inflammation through oxidative stress from oxygen free radicals, the ‘Fenton’ reaction.13 Blood transfusion may be considered on a case-to-case basis if absolutely necessary. Flexible sigmoidoscopy image of patient showing Ulcerative Colitis Endoscopic Index of Severity=7 (V2/B3/U2=7/8). Abdominal radiographs may provide vital information. Mucosal islands (or ‘thumb printing’), when seen, is a predictor of failure of medical treatment. The presence of faecal residue is consistent with uninflamed or normal colonic mucosa. Proximal constipation may be noted in left-sided or distal colitis. It may exacerbate distal disease and paradoxically require laxatives to clear, in addition to treatment of colitis. Measurement of the transverse colonic and caecal diameter (diameter >5.5 cm) supports the presence of colonic dilatation and impending toxic dilatation (figure 3). An erect chest radiograph or a lateral decubitus abdominal film may reveal colonic perforation. Abdominal radiograph showing toxic dilatation in a patient with acute severe ulcerative colitis. The differential diagnosis of diarrhoea with bleeding is broad (table 1). It is vital that infective colitis be excluded, especially in those with an abrupt onset of diarrhoea, vomiting or fever, those with a history of contact and those with recent foreign travel. Non-steroidal anti-inflammatory drugs may cause de novo colitis (which typically settles after withdrawal of the drug) but may trigger a relapse (flare) of UC. 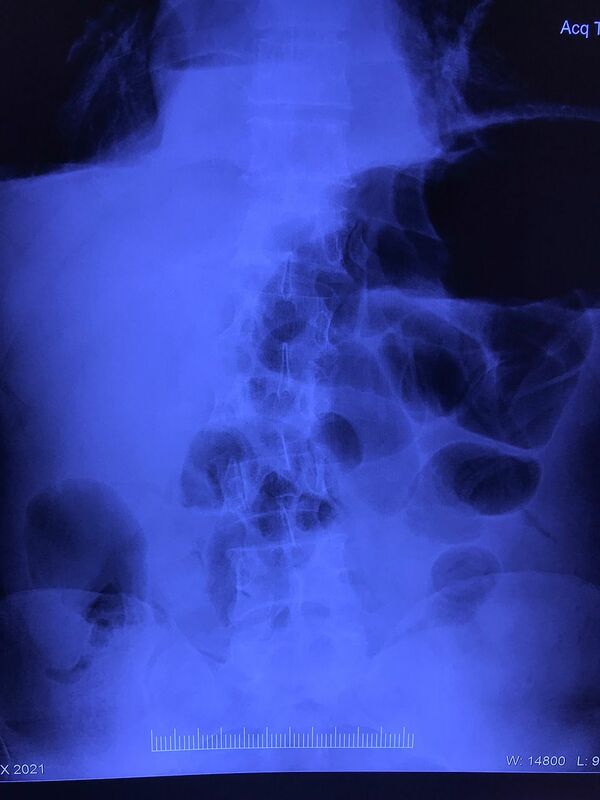 Radiation colitis should be considered in the differential diagnosis in patients with a history of abdominal or pelvic radiation, and ischaemic colitis should be considered in patients with risk factors for (or established) vascular disease. It is characterised by an abrupt onset of abdominal pain with bloody diarrhoea. Raised venous lactate, although not specific, may point towards ischaemic colitis. CMV colitis is associated with poorer outcomes and higher rates of colectomy.18 It needs to be carefully distinguished from a subclinical, self-limiting and uncomplicated CMV infection that does not impact on colitic activity. The diagnosis of CMV colitis hinges on tissue analysis with immunohistochemistry (IHC) and PCR from colonic biopsy specimens. Steroid and concomitant thiopurine therapy may be associated with CMV infection, but anti-tumour necrosis factor (TNF) therapy does not appear to increase risk.18 19 Accordingly, current guidelines recommend screening for CMV infection in the context of steroid-resistant colitis.15 Patients with ASUC should have a sigmoidoscopy with biopsy within 2 days of admission for CMV analysis from histopathology, IHC and PCR.18 Patients with confirmed CMV infection need treatment with 2–3 weeks of ganciclovir. Although due consideration may need to be given to delaying immunosuppressant therapy, this may not be feasible in steroid non-responder patients, when sequential or concurrent antiviral and salvage therapy may need to be employed on a careful case-to-case basis. Patients should have a daily (or more frequent) clinical assessment which should include physical examination, assessment of haemodynamic status, stool charts, blood tests as outlined above and abdominal radiographs. Commencement of intravenous corticosteroids notwithstanding, assessment of these parameters provides valuable metrics of clinical response and the need for ‘rescue therapy’ as outlined later. Acknowledging that successful outcomes for ASUC hinge on multidisciplinary decisions, colorectal surgeons should be consulted early in the course of admission, should medical treatment fail or indeed surgery be more appropriate. Three RCTs have investigated the role of adjunctive antibiotics (ciprofloxacin, metronidazole and tobramycin) in patients with ASUC and did not show any benefit over steroids.24–26 Thus, routine use of intravenous antibiotics offers no therapeutic advantage in uncomplicated colitis, although they may be appropriate in patients in whom infection is suspected. The principles of supportive therapy in ASUC are summarised in box 1. Admit to a specialist gastroenterological ward for multidisciplinary care (joint medical and surgical). Daily clinical assessment and examination. Daily electrolytes and C reactive protein and abdominal X-ray. Nutritional assessment and optimisation of nutritional status. Bowel rest is of no proven benefit. Unprepared flexible sigmoidoscopy at the earliest opportunity. Prophylaxis against venous thromboembolism with low molecular weight heparin. Empirical antibiotics are of no benefit, except where infection is suspected, or there is incipient perforation or toxic megacolon. Avoid anticholinergics, opiates and antidiarrhoeal agents, as they increase the risk of colonic dilatation and perforation. Up to a third of patients will fail to respond to intravenous corticosteroids and are termed ‘steroid refractory’.29 It is therefore imperative that early clinical risk stratification tools be employed to identify such patients to enable salvage therapy with medical treatment using either ciclosporin or IFX and indeed surgery. 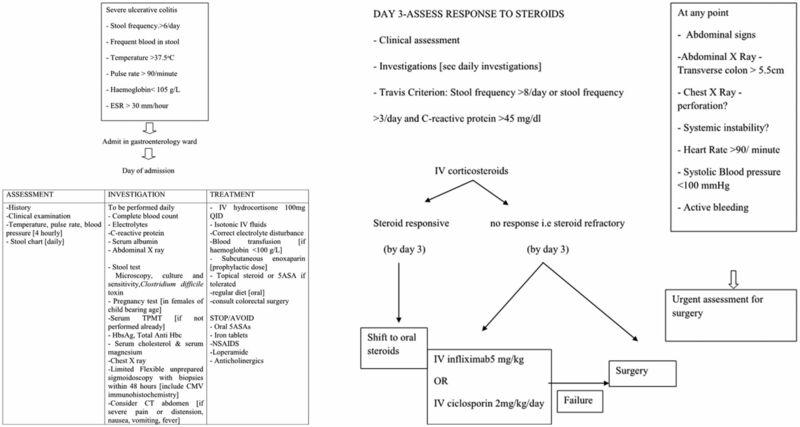 Patients who do not respond to steroid therapy between days 3 and 5 are at high risk of intravenous corticosteroid therapy failure and should be considered for second-line ‘rescue’ therapy or surgery (table 3 and figure 1). Several mathematical risk stratification tools incorporating clinical criteria have been developed and predict the need for timely rescue therapy or colectomy (table 3). A pitfall with the use of the Travis criterion is its use of stool frequency as a predictive factor for steroid failure, which is a patient-reported outcome and a subjective clinical variable dependent on rectal inflammation, which may in turn be influenced by tenesmus and/or local therapy. Among studies without the use of stool frequency for prediction for steroid failure, studies have used UCEIS, a validated composite score ranging from 0 to 8 and incorporating vascular pattern, bleeding and the presence of erosions and ulcers in unprepared sigmoidoscopy.16 A retrospective study of 89 patients found all patients of UCEIS >6 (within 2 weeks of admission) failed intravenous steroids.32 A prospective study of 90 patients with ASUC noted that faecal calprotectin (FC) was significantly higher in patients undergoing colectomy during the hospital stay, with a level >1992.5 µg/g associated with the need for colectomy over the next year.33 A recent prospective study of 49 patients from India found that all patients with UCEIS >6 on admission and FC >1000 µg/g on day 3 failed steroid therapy.17 These new indices without stool frequency, if validated, would provide an objective measure of risk of steroid failure. Lichtiger et al in his study demonstrated the efficacy of ciclosporin in acute steroid-refractory UC. Nine out of 11 patients with steroid-refractory UC who received ciclosporin (4 mg/kg) as a continuous intravenous infusion improved, whereas all nine patients who received placebo showed no improvement.34 Three of 11 and 4 of 9 patients underwent colectomy in the ciclosporin and placebo groups, respectively. Ciclosporin therapy may be associated with significant toxicity. Serious infections have been reported in 5% of patients and mortality in 1%–3%.37 40 41 Major adverse events related to ciclosporin therapy include nephrotoxicity (6.3%), seizures (3.6%), anaphylaxis (0.9%) and death (1.8%).41 Other adverse events include paraesthesia, hypertension, hypertrichosis, headache, minor infections, hyperkalaemia, hypomagnesaemia and gingival swelling. The CONSTRUCT trial 2010–2013 was a mixed-methods, open-label, pragmatic randomised trial including 270 patients. Patients were randomly allocated (1:1) to receive either IFX (5 mg/kg intravenous infusion given over 2 hours at baseline, and again at 2 weeks and 6 weeks after the first infusion) or ciclosporin (2 mg/kg per day by continuous infusion for up to 7 days, followed by twice-daily tablets delivering 5.5 mg/kg per day for 12 weeks). The primary outcome was quality-adjusted survival. There was no statistically significant difference between the two for the primary end point as well as the secondary end point of colectomy rates, time to colectomy, serious adverse events or death. IFX, however, was associated with a greater cost of treatment as compared with ciclosporin.52 That said, biosimilars to IFX are now available and cost of therapy is reducing. IFX therapy has been associated with a reduced length of stay in one study—median 4 days (IQR 4.0–5.75) with IFX compared with 11 days (IQR 7.75–13.25) with ciclosporin.64 Although the CONSTRUCT trial did not find any difference in the length of stay with either therapy, patients and physicians noted greater treatment satisfaction with IFX.52 It seems very likely that the current evolution in our understanding and application of pharmacokinetics of IFX in ASUC will shape and favour the use of IFX as preferred salvage therapy in most units. Protein losses through an inflamed colon can lead to the drug sink effect, when therapeutic monoclonal antibodies can pass through colonic mucosa and are lost in stool (58). Brandse and colleagues reported detectable IFX in the faeces of patients after the first IFX infusion (58). Patients not showing endoscopic response at weeks 6–8 had higher faecal losses at day 1 and lower IFX levels at week 6, often associated with the development of antibodies (61). Taken together, the evidence for improved outcomes from dose intensification, underpinned by the altered pharmacokinetics in ASUC and the lack of any pronounced risk of side effects, is gathering momentum, and it is likely that if supported by RCTs, will translate into clinical practice which is an urgent and unmet need. ASUC is a medical emergency that requires hospitalisation for intensive monitoring and therapy under a gastroenterologist with experience in managing IBD. Despite significant advances, the cornerstone of management is still the use of intravenous corticosteroids. Up to a third of patients will prove refractory to therapy and need a multidisciplinary approach with the patient, gastroenterologist, colorectal surgeon and stoma therapist. The critical decision for patients who have not responded to corticosteroids by day 3 is between medical rescue therapy and surgery. Both ciclosporin and IFX appear safe and effective when used appropriately and in experienced hands. Ciclosporin is an option in AZA-naïve patients who can be effectively bridged to purine immunomodulator maintenance therapy. In patients receiving rescue medical therapy, colectomy needs to be considered if there is no improvement by days 4–7 in discussion with the multidisciplinary team. Colectomy can treat acute colitis by excising diseased tissue and reduces future risk of recurrence and malignancy. However, it carries important functional and psychological implications, which deserve consideration. Evolving understanding of cytokine profiles and the inflammatory burden in ASUC along with the pathophysiology of gut permeability and potential for suboptimal drug delivery through altered pharmacokinetics of available treatments has seen cautious translation into medical territory and will shape our paradigms with medical treatment. Whether these evolving approaches will translate into timely and meaningful control of disease remains to be seen. Meanwhile, the clock starts ticking the moment a patient with ASUC is hospitalised, and, with investigation and treatment, timing is still everything. Intravenous corticosteroid therapy forms the cornerstone of treatment for patients admitted with acute severe ulcerative colitis. Early liaison with colorectal surgeons and for steroid non-responders by day 3—also a stoma therapist and psychologist—is appropriate in anticipation of the need for colectomy if required. A time-bound approach for steroid non-responders between days 3 and 5 assessing predictors of response is critical to favourable outcomes. Infliximab, ciclosporin or surgery are three rescue options. Delaying or denying colectomy to the patient ‘failing’ medical treatment may lead to adverse outcomes. What is the efficacy of biosimilars in ASUC? What is the optimal pharmacokinetic based dosing of IFX for better response rate in ASUC? Controlled data from trials evaluating novel and experimental therapies are needed. Objective predictors of steroid failure are needed. What is the optimal timing for colectomy? Roberts SE, Williams JG, Yeates D, et al. Mortality in patients with and without colectomy admitted to hospital for ulcerative colitis and Crohn's disease: record linkage studies. BMJ 2007;335:1033. An important study emphasising the importance of timely surgery and adverse outcomes with inappropriate delay in considering colectomy. Travis SP, Farrant JM, Ricketts C, et al. Predicting outcome in severe ulcerative colitis. Gut 1996;38:905–10. Landmark study that prognosticates ‘high-risk’ patients and led to a paradigm shift in clinical decision making in acute severe ulcerative colitis. Grainge MJ, West J, Card TR. Venous thromboembolism during active disease and remission in inflammatory bowel disease: a cohort study. Lancet 2010;375:657–63. A thought-provoking paper demonstrating high-risk venous thromboembolism in patients with inflammatory bowel disease. Laharie D, Bourreille A, Branche J, Allez M, Bouhnik Y, Filippi J, et al. Ciclosporin vs infliximab in patients with severe ulcerative colitis refractory to intravenous steroids: a parallel, open-label randomised controlled trial. Lancet Lond Engl. 2012;380(9857):1909–15. First study prospectively comparing infliximab and ciclosporin for steroid refractory ulcerative colitis. Williams JG, Alam MF, Alrubaiy L, et al. Infliximab vs ciclosporin for steroid-resistant acute severe ulcerative colitis (CONSTRUCT): a mixed methods, open-label, pragmatic randomised trial. Lancet Gastroenterol Hepatol. 2016;1(1):15–24. Prospective head-to-head comparision between infliximab and ciclosporin as rescue therapy in acute severe ulcerative colitis. In the assessment of acute severe UC, a colonoscopy is mandatory. Patients failing intravenous corticosteroids between days 7 and 10 should be considered for pharmacological salvage therapy with infliximab or ciclosporin. Ciclosporin therapy is the best option for steroid-refractory patients with acute severe UC already taking azathioprine. Combination therapy with infliximab and ciclosporin A in acute severe UC is more effective and is associated with lower morbidity. 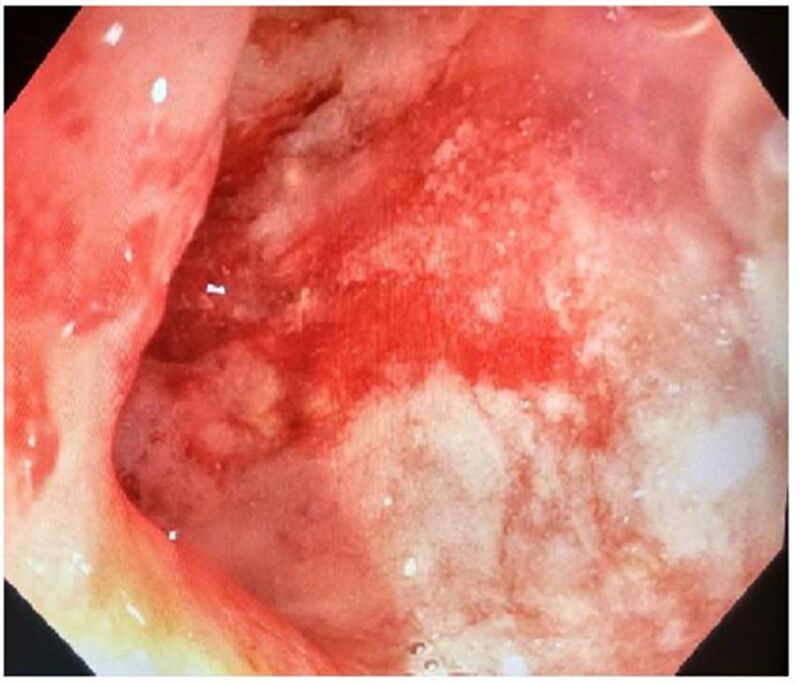 Despite the availability of modern and effective therapy for steroid-refractory acute severe UC, timely consideration of colectomy is appropriate.
. Cortisone in ulcerative colitis; final report on a therapeutic trial. Br Med J 1955;2:1041–8.
. Enteral versus parenteral nutrition as adjunct therapy in acute ulcerative colitis. Am J Gastroenterol 1993;88:227–32.
. Intravenous tobramycin and metronidazole as an adjunct to corticosteroids in acute, severe ulcerative colitis. Am J Gastroenterol 1994;89:43–6.
. A prospective randomized controlled trial of oral ciprofloxacin in acute ulcerative colitis. Am J Gastroenterol 1997;92:454–6.
. Combination of corticosteroids with 5-aminosalicylic acids compared to corticosteroids alone for hospitalized patients with active ulcerative colitis. Isr Med Assoc J 2016;18:613–8.
. Randomized, double-blind comparison of 4 mg/kg versus 2 mg/kg intravenous cyclosporine in severe ulcerative colitis. Gastroenterology 2003;125:1025–31.
. Ciclosporin use in acute ulcerative colitis: a long-term experience. Eur J Gastroenterol Hepatol 2005;17:79–84. Contributors SJ, JKL and VA conceptualised the topic. SJ, JKL and VA did the literature search and review. SJ and JKL produced the manuscript draft and all three authors were involved with the critical review of the manuscript. All three authors approve the revised and final manuscript.